Arizona sophomore quarterback Khalil Tate goes deep with a pass against USC during the Wildcats 49-35 loss last season. The University of Arizona football team is off to its worst start since 1981, after consecutive losses to teams named the Cougars (BYU and Houston). Lucky for first-year coach Kevin Sumlin and his players, this week's opponent is Southern Utah of the Football Championship Subdivision. The Thunderbirds of SUU have somehow gotten off to an even rockier start than Sumlin's bunch—falling to North Alabama and Oregon State to start the season. The Wildcats will look to right their litany of wrongs with the game scheduled to kick off at 8 p.m. on the Pac-12 Network. The good news, besides the fact that Arizona gets to play a team that's lost to two no-name teams, is that Arizona gets its most experienced offensive lineman (Layth Friekh) back after a two-game suspension. Friekh and his offensive linemates will look to a rushing attack that has been abysmal in two games—averaging a measly 3.3 yards per carry (half of what they averaged in 13 games a year ago). 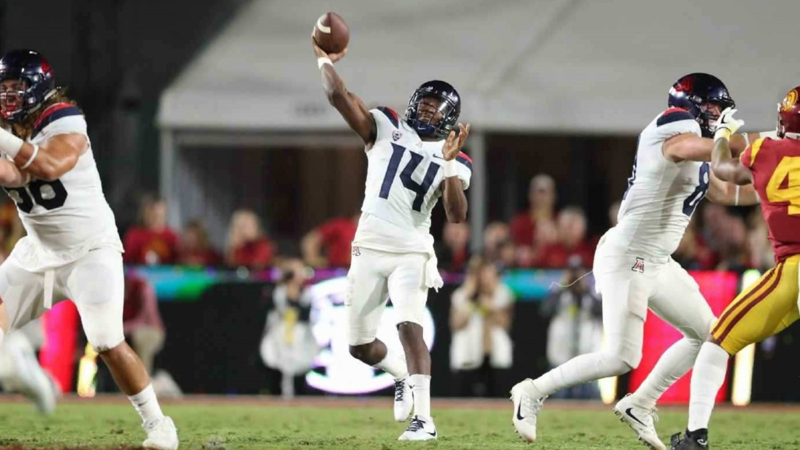 The main beneficiary of Friekh's return is junior quarterback Khalil Tate, who has looked lost at times in the team's two losses. Tate, who entered with a chorus of Heisman Trophy hype, has been stymied in all aspects of the game—completing 53.6 percent of his passes for 578 yards and 1 TD this season. More importantly, Tate's legs have been a non-factor through two games, with 22 rushing yards on 15 carries and 2 rushing touchdowns this season. It'll be interesting to see if Tate, who appeared lost for much of last week's game in Houston, can get back to his wily ways against the Thunderbirds this week. Can Tate and Noel Mazzone coexist? Much of Tate's aforementioned struggles this season have come from his offensive line's inability to open up space in the trenches. That aspect is out of his control, obviously—though first-year offensive coordinator Noel Mazzone's offensive scheme doesn't appear to be helping much. Mazzone has been a fixture in college football the last quarter-century, coaching NFL quarterbacks like Phillip Rivers and Josh Rosen at North Carolina State and UCLA. The issue is that Mazzone's traditional offense relies on a lot of drop-back, drawn-out pass plays, which doesn't really fit Tate's run first, pass second quarterback style. Tate is a gifted passer, but has traditionally used his explosive run capabilities to force defensive backs to inch up toward the line of scrimmage, when he then proceeds to crush them over the top. He can't really do that if he's not given the opportunity to run the ball in the first place, or if the line can't free up space for him to make timely decisions. There's still plenty of time left in the season, and no reason to hit the panic button in Tucson. It'll be important to keep an eye on whether Mazzone allows Tate to do what he needs to to succeed, though, with the fate of the Wildcats' season hanging in the balance. Can anyone make a defensive stop? The Wildcats were absolutely trounced for much of last week's road game in the Space City, losing 45-18 to the Cougars. Defensive coordinator Marcel Yates' unit looked abysmal for much of the day, surrendering 297 rushing and 254 passing yards to the Cougars, while failing to force a single turnover in the process. This is flat-out embarrassing, given the fact that Yates is now in his third year as the team's D-coordinator, with a talented roster full of young-but-experienced players. His unit had no pass rush a week ago, which led to frequent humiliation when Houston QB D'Eriq King proceeded to sit back in the pocket and dissect their overmatched secondary. It's early, but the Wildcats' defense will need a major turnaround to save face, and the season while they're at it. All is not lost in Tucson, no matter what you, the discerning reader, take from my first two bullet-points. Senior wideout Shawn Poindexter has looked excellent so far, with 11 catches for 202 yards this year. If Poindexter keeps it up, he'll become the first Wildcat since Cayleb Jones in 2014 to crack the 1,000 yard plateau. The 6-foot-5-inch receiver has looked explosive at times this season, a year after hauling in a measly 294 yards in 13 games for Arizona. Poindexter believes his early season success speaks to the team's potential going forward, expressing confidence that the team will shake off its early funk. “Anytime you get a new coaching staff and a whole new system, especially under a young quarterback, you expect growing pains and guys are still learning it and guys are still trusting it," Poindexter said at Tuesday's media availability. It'll be interesting to see whether his prognosis is correct or not, with the Pac-12 season kicking off on Sept. 22 against Oregon State.